Martin J. Barrett was born in Philadelphia, PA and raised in Northeast Philadelphia, PA where he graduated in 1967 from Father Judge High School. He is a graduate of DeSales University, class of 1971. He met his wife in Allentown, PA who was a Nursing Student at the time. They married and eventually moved to Newark, DE in 1975 where he, his wife and family were parishioners of Holy Family Parish. Marty was ordained to the Permanent Diaconate on November 17, 2001 by the late Bishop Michael Saltarelli. Marty and his wife moved to Milton in 2007. Deacon Marty retired from the banking industry in 2010 and his wife retired from Christiana Care Hospital in 2013 as a Registered Nurse. They presently reside in Cannery Village with their English Bulldog, Murphy. 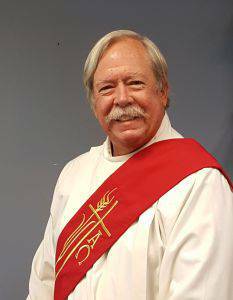 Deacon Marty was assigned to St. Jude The Apostle in September, 2016.